Are We Really Living in the End Times? This is a legitimate question. Many believers before us were firmly convinced that the Lord would return in their day. For example, the apostle Paul, the church father Tertullian, the medieval abbot Bernard of Clairvaux, the Reformer Martin Luther, the founder of Midnight Call Ministries Wim Malgo (1922 – 1992), and many others. Were these brothers in the Lord all wrong? No. On the contrary, they lived with the biblically correct attitude of expecting Christ at any time. The last request in the Bible is, “Amen. Even so, come, Lord Jesus.” And, right now in our day, more than ever we have grounds to expect the swift coming of our Lord. Let yourself be encouraged by the imminent expectation of our Lord Jesus Christ. We don’t know exactly when the Lord will appear, but the New Testament gives us clues (cf., e.g. Mt 24 – 25). Therefore, it is not wrong to pay attention to the signs of the times and to soberly draw the right conclusions. If we compare, for example, the end-times statements in 2 Timothy 3 with the state of the world and church today, then we must admit that the end has come closer. Certainly, Paul wrote about his time and was convinced that he lived in the end times. Nevertheless, it is without question that the eschatological developments spoken of in 2 Timothy 3:1-8 are increasing as the return of Jesus draws nearer. The English Standard Version gives these verses the heading, “Godlessness in the Last Days.” This is also a striking inventory of our time. How quickly the former Christian values have changed in the last 50 to 70 years in the West. It doesn’t look any different in the rest of the world, either. This is apparent in the end-times amassing of wealth that is rampant in our affluent western society, as Wilfred Hahn often writes about in his column. “Everything was better in the good old days”—this is, of course, a fallacy. People without Jesus were still lost before. But in the past, the light of the church of Jesus may have been able to stop some of the overly perverse excesses of darkness in the West, especially since the Reformation. In terms of sexual morality or a sense of solidarity and duty, our society is truly in a downward spiral. As the secular proverb says, even a blind man can see it. In other areas, western society may have changed for the better. Not all Christian values have been thrown overboard. Being socially-minded, for example, is still a virtue. But much has been perverted, and certain circles seem determined to sacrifice all that is holy, pure, and of good report on the altar of supposed sexual liberation—without regard for loss. Despite all of the negative developments, we as believers should not despair or grow bitter and cynical: for He who is in us is still greater than he who is in the world (1 Jn 4:4). The exceedingly great power which raised Christ from the dead works in us through faith and the Holy Spirit (Eph 1:19-23). And it is even possible that the fullness of God the Father overflows in us—for that is precisely what Paul asks for the faithful (Eph 3:19). Our triune God can still do “exceeding abundantly above all that we ask or think, according to the power that worketh in us” (Eph 3:20). And this means that, as long as it is still the time of grace and our faithful Lord has not returned, we can be light in this world and bring about good. We work for the Lord of all lords and the King of all kings. Jesus is still greater, and He is with us “always, even unto the end of the world” (Mt 28:20). We do not want to forget this now in the end time, but instead should always keep it in mind. Our effort is not in vain in the Lord (cf. 1 Cor 15:58).—Maranatha, come soon, Lord Jesus! 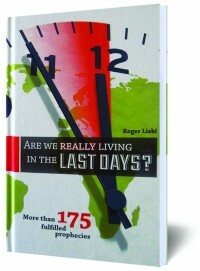 We recommend Are We Really Living in the Last Days? #2277 More than 175 fulfilled End Time prophecies help us to evaluate soberly and clearly the signs of the age.